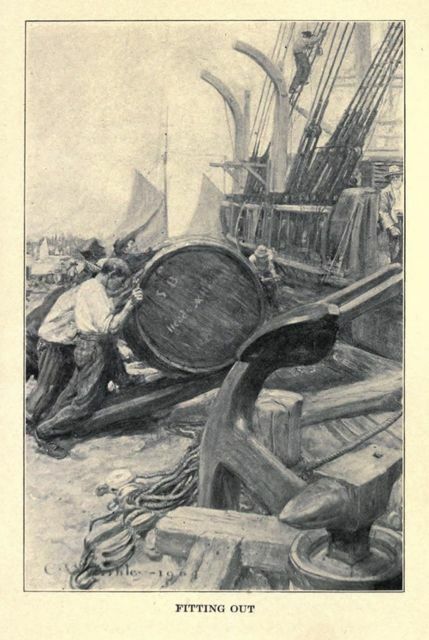 According to the invariable usage of the fishery, the whale-boat pushes off from the ship, with the headsman or whale-killer as temporary steersman, and the harpooneer or whale-fastener pulling the foremost oar, the one known as the harpooneer-oar. Now it needs a strong, nervous arm to strike the first iron into the fish; for often, in what is called a long dart, the heavy implement has to be flung to the distance of twenty or thirty feet. But however prolonged and exhausting the chase, the harpooneer is expected to pull his oar meanwhile to the uttermost; indeed, he is expected to set an example of superhuman activity to the rest, not only by incredible rowing, but by repeated loud and intrepid exclamations; and what it is to keep shouting at the top of one's compass, while all the other muscles are strained and half started- what that is none know but those who have tried it. For one, I cannot bawl very heartily and work very recklessly at one and the same time. In this straining, bawling state, then, with his back to the fish, all at once the exhausted harpooneer hears the exciting cry- "Stand up, and give it to him!" He now has to drop and secure his oar, turn round on his centre half way, seize his harpoon from the crotch, and with what little strength may remain, he essays to pitch it somehow into the whale. No wonder, taking the whole fleet of whalemen in a body, that out of fifty fair chances for a dart, not five are successful; no wonder that so many hapless harpooneers are madly cursed and disrated; no wonder that some of them actually burst their blood-vessels in the boat; no wonder that some sperm whalemen are absent four years with four barrels; no wonder that to many ship owners, whaling is but a losing concern; for it is the harpooneer that makes the voyage, and if you take the breath out of his body how can you expect to find it there when most wanted! Again, if the dart be successful, then at the second critical instant, that is, when the whale starts to run, the boatheader and harpooneer likewise start to running fore and aft, to the imminent jeopardy of themselves and every one else. It is then they change places; and the headsman, the chief officer of the little craft, takes his proper station in the bows of the boat. Now, I care not who maintains the contrary, but all this is both foolish and unnecessary. The headsman should stay in the bows from first to last; he should both dart the harpoon and the lance, and no rowing whatever should be expected of him, except under circumstances obvious to any fisherman. I know that this would sometimes involve a slight loss of speed in the chase; but long experience in various whalemen of more than one nation has convinced me that in the vast majority of failures in the fishery, it has not by any means been so much the speed of the whale as the before described exhaustion of the harpooneer that has caused them.